Nicole is happy to be involved in this wonderful afternoon. The unique experience and opportunity is quite humbling and she thanks Mrs. McFarlin for approaching her to take part in it. Nicole is an extremely busy KHS Senior actively involved in Madrigals, Poms, National Honor Society, portraying Juliet’s nurse in KHS’ fall play Romeo and Juliet, and holding down two jobs, in addition to AP classes, applying to colleges and keeping calm (or pretending to…). She has also been in numerous musicals at KHS and through KAI. Her most recent musical performance was as Donkey in Shrek: the Musical last spring at KHS. She is planning to major in musical theatre next fall and thanks the Kaneland School District, Kaneland Arts Initiative and the Kaneland Community for endless opportunities and support. Nicole hopes everyone enjoys this beautiful, unique performance. What do you want to be when you grow up? I am planning to major in Musical Theatre, so hopefully somewhere in that business, preferably on stage. Do you have any favorite teachers? If so, why were they your favorite? I have many favorite teachers. Mrs. Zulkowski, Mr. Kowalski (former KHMS choir director), Mrs. Grant, Mr. Kunstman, Mrs. Staker and Mrs. McFarlin for always believing in me, always supporting me and constantly teaching me to pursue what my passion is. Also Mr. Busch (former KHS History teacher) and Mr. Bruno for teaching their classes with such conviction and overwhelming adoration of their subject. Their love for teaching has led me to love learning from them. Did you walk to elementary school or ride a bus? Any funny memories? I rode the bus because, like a significant percentage of other Kaneland students, I live among the cornfields. What excites you the most about education? Every moment we live is a moment in which we can learn. 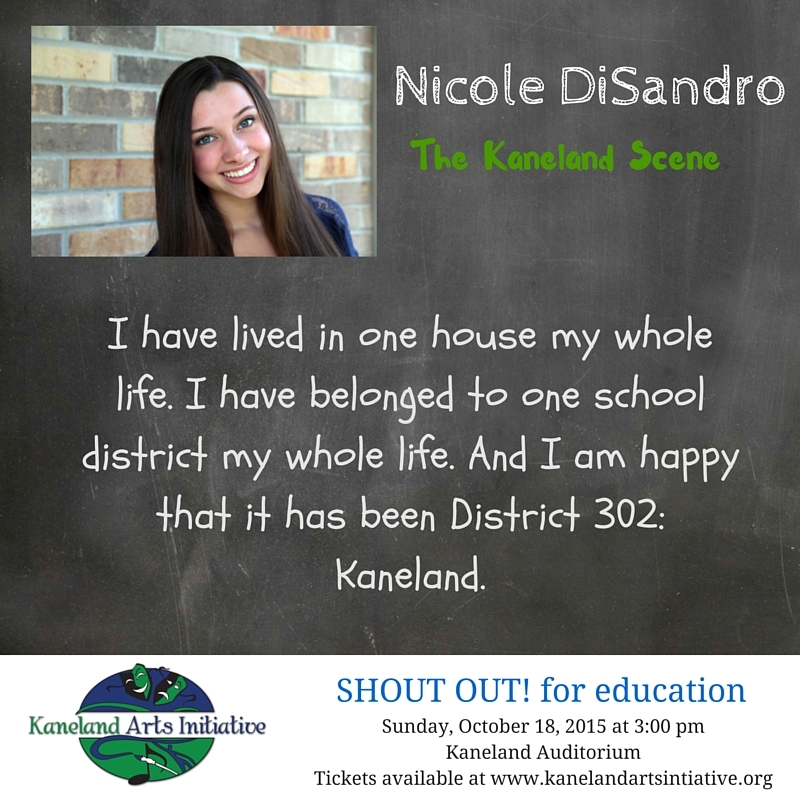 You’ll have the opportunity to hear Nicole read, The Kaneland Scene, on Sunday, October 18th at 3pm. CLICK HERE TO GET TICKETS TO THE SHOUT OUT!